Last week our counting problems were hard. So we have a few easier problems this week. Oct 29: Barney Schwinn notices that the odometer on his bicycle reads , a palindrome, because it reads the same forward and backward. After riding more hours that day and the next, he notices that the odometer shows another palindrome, . What was his average speed in miles per hour? Oct 30: Austin and Temple are miles apart along Interstate 35. Bonnie drove from Austin to her daughter’s house in Temple, averaging miles per hour. Leaving the car with her daughter, Bonnie rode a bus back to Austin along the same route and averaged miles per hour on the return trip. What was the average speed for the round trip, in miles per hour? Answer: B. Total distance = 100. Total time = 50/60 + 50/40. Average speed = 100/(50/60+ 50/40) = 48. Oct 31: Ted’s grandfather used his treadmill on 3 days this week. He went 2 miles each day. On Monday he jogged at a speed of 5 miles per hour. He walked at the rate of 3 miles per hour on Wednesday and at 4 miles per hour on Friday. If Grandfather had always walked at 4 miles per hour, he would have spent less time on the treadmill. How many minutes less? Nov 1: Steve’s empty swimming pool will hold gallons of water when full. It will be filled by hoses, each of which supplies gallons of water per minute. How many hours will it take to fill Steve’s pool? Answer: A. 24000/(2.5*4*60) = 40. Nov 2: The Incredible Hulk can double the distance he jumps with each succeeding jump. If his first jump is 1 meter, the second jump is 2 meters, the third jump is 4 meters, and so on, then on which jump will he first be able to jump more than 1 kilometer? Answer: 11. It tries to trick you since 2^10 = 1024, but the first jump is 2^0. Nov 3: A sequence of numbers starts with , , and . The fourth number of the sequence is the sum of the previous three numbers in the sequence: . In the same way, every number after the fourth is the sum of the previous three numbers. What is the eighth number in the sequence? Nov 4: A ball is dropped from a height of meters. On its first bounce it rises to a height of meters. It keeps falling and bouncing to of the height it reached in the previous bounce. On which bounce will it rise to a height less than meters? This week we will work on counting problems. They are usually hard and appear at the end of the AMC 8 tests. Oct 22: Samantha lives 2 blocks west and 1 block south of the southwest corner of City Park. Her school is 2 blocks east and 2 blocks north of the northeast corner of City Park. On school days she bikes on streets to the southwest corner of City Park, then takes a diagonal path through the park to the northeast corner, and then bikes on streets to school. If her route is as short as possible, how many different routes can she take? Answer: E. From home to southwest corner of City Park: 3 ways; From northeast corner of the Park to school, 6 ways. In total: 3*6 = 18. Oct 23: How many 3-digit positive integers have digits whose product equals ? Answer: D. Let x, y and z be the 3 digits. x*y*z = 24 = 2*2*2*3. If the three numbers are 2, 3, 4, there are 6 permutations. If the numbers are 2, 2, 6, there are 3 permutations. If the numbers are 1, 3, 8, there are 6 permutations. If the numbers are 1, 4, 6, there are 6 permutations. Oct 24: How many whole numbers between 1 and 1000 do not contain the digit 1? Answer: 728. The units, tens and hundreds positions each has 9 options, 0, 2-9. This gives 9*9*9. However, 000 is less than 1 and so has to be excluded. Oct 25: Everyday at school, Jo climbs a flight of stairs. Jo can take the stairs , , or at a time. For example, Jo could climb , then , then . In how many ways can Jo climb the stairs? Oct 26: Three , three , and three are placed in the nine spaces so that each row and column contain one of each letter. 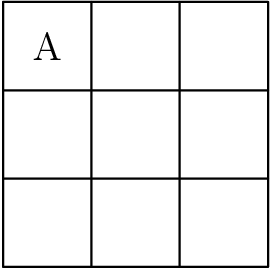 If is placed in the upper left corner, how many arrangements are possible? Oct 27: How many non-congruent triangles have vertices at three of the eight points in the array shown below? Oct 28: For how many positive integer values of are both and three-digit whole numbers? Answer: A. n/3>=100, 3n<1000. So n=300, 301, …333. But among those we only count multiples of 3, so n=300, 303, 306, 309, 312, 315, … 333. This week we will work more on problems related to integers. There are lots of such problems in AMC 8! Oct 15: What is the units digit of ? Oct 16: What is the sum of the prime factors of ? Oct 17: The hundreds digit of a three-digit number is more than the units digit. The digits of the three-digit number are reversed, and the result is subtracted from the original three-digit number. What is the units digit of the result? Oct 18: What is the correct ordering of the three numbers, , , and ? Oct 19: Hui is an avid reader. She bought a copy of the best seller Math is Beautiful. On the first day, Hui read of the pages plus more, and on the second day she read of the remaining pages plus pages. On the third day she read of the remaining pages plus pages. She then realized that there were only pages left to read, which she read the next day. How many pages are in this book? Oct 20: The hundreds digit of a three-digit number is more than the units digit. The digits of the three-digit number are reversed, and the result is subtracted from the original three-digit number. What is the units digit of the result? Oct 21: The positive integers and are the two smallest positive integers for which the product of and is a square and the product of and is a cube. What is the sum of and ? This week we focus on problems related to mean, median and mode. Recall mean is the average, median is the middle number in a sorted list and mode is the number that appears the most. Oct 8: What is the sum of the mean, median, and mode of the numbers ? Answer: C. The sorted list is 0, 0, 1, 2, 3, 3, 3, 4. Median = 2.5, Mode = 3, Mean = 16/8=2. Oct 9: Hammie is in the grade and weighs 106 pounds. Her quadruplet sisters are tiny babies and weigh 5, 5, 6, and 8 pounds. Which is greater, the average (mean) weight of these five children or the median weight, and by how many pounds? Answer: E. Average = (5+5+6+8+106)/5=26, Median = 6. Oct 10: The mean, median, and unique mode of the positive integers 3, 4, 5, 6, 6, 7, and are all equal. What is the value of ? Answer: D. Mode = 6 since mode is unique. Median = (3+4+5+6+6+7+x)/7 = 6. x= 11. Oct 11: Let be a set of nine distinct integers. Six of the elements are 2, 3, 4, 6, 9, and 14. What is the number of possible values of the median of ? Answer: D. This is a hard one… Let x<y<z be the other 3 numbers. If z<3, then 3 is the median. (Note 2 cannot be the median.) If x>9, then 9 is the median. (Note that 14 cannot be the median.) If y<4 and z>4, then 4 is the median. If x<6 and y>6, then 6 is the median. Can you find x, y and z so that x is the median? y is the median? and z is the median? Oct 12: Here is a list of the numbers of fish that Tyler caught in nine outings last summer: Which statement about the mean, median, and mode is true? Answer: A. The sorted list 0, 0, 1, 1, 2, 2, 3, 3, 3. Mean = 15/9, mode = 3, median = 2. Oct 13: Isabella must take four 100-point tests in her math class. Her goal is to achieve an average grade of 95 on the tests. Her first two test scores were 97 and 91. After seeing her score on the third test, she realized she can still reach her goal. What is the lowest possible score she could have made on the third test? Answer: B. (97+91+x+100)/4 >= 95. x >= 92. Oct 14: Andy and Bethany have a rectangular array of numbers with rows and columns. Andy adds the numbers in each row. The average of his sums is . Bethany adds the numbers in each column. The average of her sums is . What is the value of ? This week we focus on problems related to fractions, ratios and proportions. Oct 1: Rachelle uses pounds of meat to make hamburgers for her family. How many pounds of meat does she need to make hamburgers for a neighborhood picnic? Oct 2: Peter’s family ordered a 12-slice pizza for dinner. Peter ate one slice and shared another slice equally with his brother Paul. What fraction of the pizza did Peter eat? Oct 3: There are students at Colfax Middle School, where the ratio of boys to girls is . There are students at Winthrop Middle School, where the ratio of boys to girls is . The two schools hold a dance and all students from both schools attend. What fraction of the students at the dance are girls? Oct 4: Ryan got of the problems correct on a -problem test, on a -problem test, and on a -problem test. What percent of all the problems did Ryan answer correctly? Oct 5: The top of one tree is feet higher than the top of another tree. The heights of the two trees are in the ratio . In feet, how tall is the taller tree? Oct 6: Of the balls in a large bag, are red and the rest are blue. How many of the red balls must be removed from the bag so that of the remaining balls are red? Answer: D. (500*80%-x)/(500-x) = 75%. x=100. Oct 7: The lengths of the sides of a triangle in inches are three consecutive integers. The length of the shortest side is of the perimeter. What is the length of the longest side?